Analysing the processes of globalization, digitalization and virtualization has a substantial impact on shaping present-day supply chains. Alongside these progressing trends, the meaning of supply chains and networks increases, especially in the process of fulfilling the needs of digital consumers. A consumer who uses technology every day to acquise goods and services over the internet. 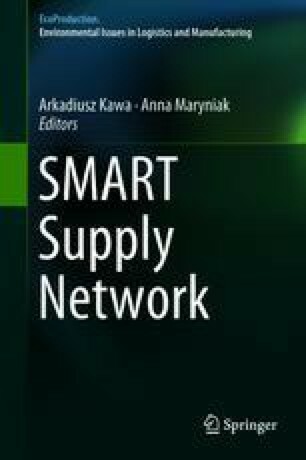 The aim of the article is to present a reflection on the mutual relationship of tools and technologies that shape the consumer’s digital needs and capabilities to meet those needs through digital, intelligent supply networks. Accenture. Dynamic Digital Customer. https://www.accenture.com/pl-pl/_acnmedia/PDF-39/Accenture-PoV-Dynamic-Consumers.pdf. Alicke, K., Rexhausen, D., & Seyfert A. Supply chain 4.0 in consumer goods. https://www.mckinsey.com/industries/consumer-packaged-goods/our-insights/supply-chain-4-0-in-consumer-goods. Berbeka, J. (2016). Wirtualna i rozszerzona rzeczywistość a zachowania konsumentów [Virtual and augmented reality and consumer behaviour]. Studia Ekonomiczne/Uniwersytet Ekonomiczny w Katowicach. Ekonomia, 303(7), 84–101. http://cejsh.icm.edu.pl/cejsh/element/bwmeta1.element.cejsh-1cf50c0e-ca3c-4297-8cad-5c82edbc9983/c/06.pdf. Christopher, M. (2016). Logistics and supply chain management. https://books.google.pl/books?id=NIfQCwAAQBAJ&printsec=frontcover&dq=logistics+and+supply+chain+management+christopher&hl=pl&sa=X&ved=0ahUKEwj9yO319MjZAhXRyaQKHdt0CQgQ6AEILzAB#v=onepage&q=logistics%20and%20supply%20chain%20management%20christopher&f=false. Ericsson. (2018). 10 hot consumer trends. https://www.ericsson.com/assets/local/networked-society/consumerlab/10hct_report2018_rgb.pdf. Ernst&Young. The state of sustainable supply chains. http://www.ey.com/Publication/vwLUAssets/EY-the-state-of-sustainable-supply-chains/$FILE/EY-building-responsible-and-resilient-supply-chains.pdf. Inpost. Już 5 mln ofert udostępnia dostawę Allegro Inpost [5 million offers with Allegro InPost delivery], press release. https://magazyn.allegro.pl/4245-juz-5-mln-ofert-udostepnia-dostawe-allegro-inpost. Inpost. Paczkomaty Inpost zintegrowane z allegro [Inpost packing machines integretes with allegro e-commerce platform], press release. https://integer.pl/pl/aktualnosci/paczkomaty-inpost-zintegrowane-z-allegro-608. Meola, A. The rise of M-commerce: Mobile shopping stats and trends. http://www.businessinsider.com/mobile-commerce-shopping-trends-stats-2016-10?IR=T. Money.pl. P&G: W erze cyfryzacji konsumenci szukają marek zaangażowanych społecznie [In the era of the digitisation of consumers looking for brands involved socially]. https://www.money.pl/gielda/wiadomosci/artykul/pg-w-erze-cyfryzacji-konsumenci-szukaja,65,0,2290753.html. Patrick, K. Google’s Alphabet relaunches smart glasses for business use. https://www.supplychaindive.com/news/Google-Glass-Alphabet-corporate-warehouse-logistics/447487/. Schrauf, S., & Berttram, P. Industry 4.0: How digitization makes the supply chain more efficient, agile, and customer-focused. https://www.strategyand.pwc.com/reports/industry4.0. Żuchowski, I., & Brelik, A. Wybrane uwarunkowania wewnętrzne zachowania konsumentów [Selected internal determinants of consumer behavior]. Zeszyty Naukowe Ostrołęckiego Towarzystwa Naukowego, 21, 212–231. mazowsze.hist.pl/28/Zeszyty_Naukowe_Ostroleckiego_Towarzystwa_Naukowego/650/2007/23163/.